A subwoofer module solution for quickly upgrading existing subwoofer plate amplifier designs with an enhanced feature set that allows for state- of-the art subwoofers with minimal cost and negligible product development effort. Anadigm’s audio dpASP (dynamically programmable Analog Signal Processor) makes it simple to add AutoEQ, or just open-loop equalization and band-pass filtering and limiter projection to an active subwoofer design. SonicMaster1 is available from Anadigm a number of international OEM and ODM subwoofer plate amplifier vendors as a separate daughter board or integrated plate amp design. It comes out of the box with useable pre-sets: no engineering time or money is wasted on a steep learning curve. You may customize the default settings using an easy, graphics based package. There is no need to teach yourself how to use DSP, or hire a DSP programmer: this system works in the analog domain. If you want to get under the hood and adjust settings for, say, the compressor, it is simple using supplied software. Nothing compares to the richness and fidelity of sound reproduction with analog components. 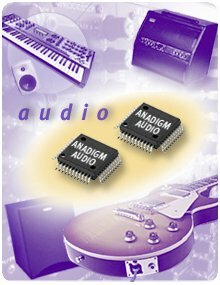 Anadigm® dpASPs simplify analog implementations of active speaker crossovers, pre-amplifier gain stages and filtering, and a host of other audio applications – while making these affordable even for high-volume systems. The key is putting pure analog signal processing under real-time software control. Dynamically reconfigurable dpASPs are the first analog components for audio that can change their parameters in real time and even undergo a complete state change – all so instantaneously as to be inaudible even to the most experienced ear. The underlying technology of the dpASP supplies a precision and stability that discrete solutions can rarely match, with design tolerances better than ±1% and exact chip-to-chip repeatability. With analog elements manipulated by software, the possibilities for audio are endless. In the case of speakers, for example, you can easily program 2nd, 3rd, and 4th order crossovers with minimal impact on phase response. Or offer user-selectable bass and treble tilt settings as pre-set configurations with no additional component cost. Or create an equalizer that adjusts automatically to the characteristics of the room in which speakers are placed. To experience the possibilities of software controlled analog for yourself, download your free evaluation copy of AnadigmDesigner®2 today.